The dynamic duo that is Penny Arcade are back once again with the next collection of their both brilliant and hilarious web comic. Magical Kids in Danger collects all the strips from 2007, featuring an introduction by Cliff Bleszinski, Design Director at Epic Games, as well as Mike Krahulik’s development artwork for the cover. As in previous volumes, writer Jerry Holkins adds commentary, thoughts and opinions to each strip, trying to work out the concept behind it, or what the thinking was, or in some cases is brutally honest and says he has no clue what they were planning at the time. 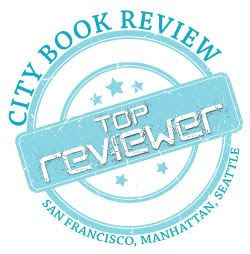 Readers get to see some of the big happenings in the video gaming world through the lens of Penny Arcade, such as the sacred arrival of the Playstation 3, and more intelligent ridiculing of game companies who profess to know what video gamers are thinking and actually want. Some beloved characters of the comic strip also make their appearances, so readers will not be disappointed with this new volume that, after being read, needs to go on the shelf right next to volumes one through seven. 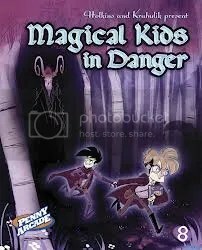 To purchase a copy of Penny Arcade 8: Magical Kids in Danger from Amazon, and help support BookBanter, click HERE. 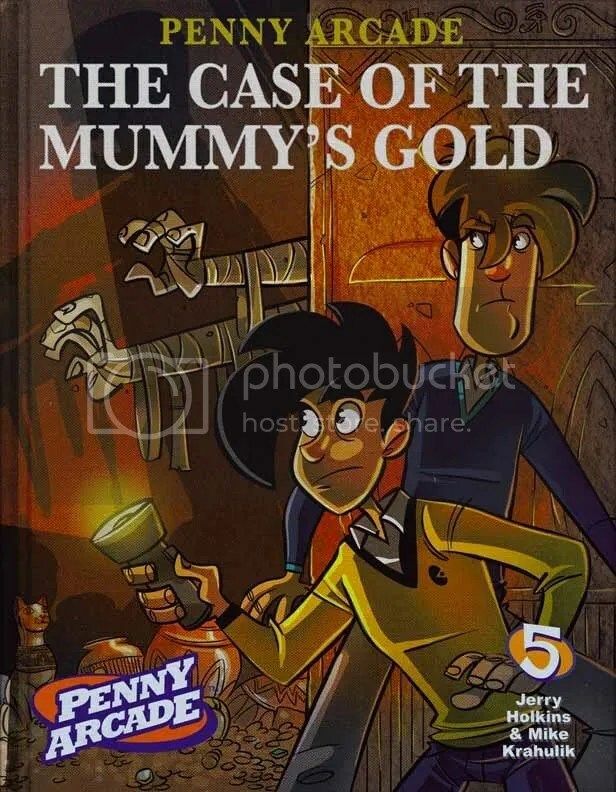 The Penny Arcade team are back again with their next long-awaited volume of the online comic: The Case of the Mummy’s Gold. Volume 5 features a Hardy Boys classic looking cover as Gabe and Tycho stand wary by a door in geeky-looking outfits that bare a resemblance to classic Star Trek uniforms, as a pair of mummy’s arms stretch from the open doorway. Volume 5 features some familiar characters, including our infamous fruit crushing friend, as well as some new concepts like their take on the Oriental Last Rites comic. With the advent of popular Mass Multi-Player Online (MMO) games like World of Warcraft and the Star Wars MMO, Penny Arcade embarked on a new chapter of online comics with lascivious praise on some games like the former mentioned above, and scornful berating and insult on games like the latter. Penny Arcade also became aware of their growing popularity and the fact that many people read the blogs and the comic and took the advice they offered. With this power they began ridiculing and mocking different companies in the games industry much to the amusement of the fans. It’s what really launched the comic into superstardom as it began fighting back for the fans. Whether you’re picking Penny Arcade up for the first time, or simply addictively adding the next volume to your collection (like me), The Case of the Mummy’s Gold will be a welcome recruit, with lots of extra sketches from the different conventions they attended, including the actual paper tablecloth doodles they made to pass the time. And if that’s not enough, there’s always the entertaining comments they’ve made on each comic about whether they liked it, or thought the concept totally failed, or simply have no recollection of what they did or were attempting to do. Originally written on October 7th, 2008 ©Alex C. Telander. Penny Arcade will be interviewed in Episode 29 of BookBanter available April 1st.